The Lord Jesus first miracle at a wedding in Cana of Galilee, Lebanon. John 2:7 Jesus saith unto them, Fill the waterpots with water. And they filled them up to the brim. And he saith unto them, Draw out now, and bear unto the governor of the feast. And they bare it. When the ruler of the feast had tasted the water that was made wine, and knew not whence it was. 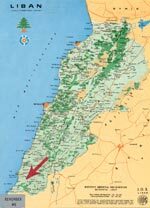 Jesus was invited to a marriage in Cana of Galilee, a village near Tyre, in the south of Lebanon. 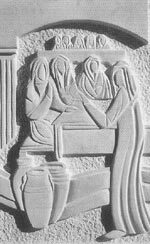 Jesus’ mother, The Virgin Mary and his disciples were also invited. The wine ran out and Mary told Jesus that there was no more wine. Mary then told the servants to do exactly what Jesus tells them. There were six stone water pots that were used by the people for washing and purifying themselves and Jesus told the servants to fill them with water. Then he told them to take from them and give to the master of the banquet who tasted the water that had turned into wine. He did not know where the wine had come from, but the servants did. So he called the bridegroom and said that the best wine is always served first and after the guests have had plenty, the other wine is served but you have kept the best wine till the last. This was the first miracle of Jesus which took place in Cana of Galilee, a village near Tyre in the south of Lebanon. Very recently excavations uncovered by accident the ruins of a very old church with the story of the miracle of changing water into wine engraved unto the rocky walls in pictures.